The Irish love their drink. 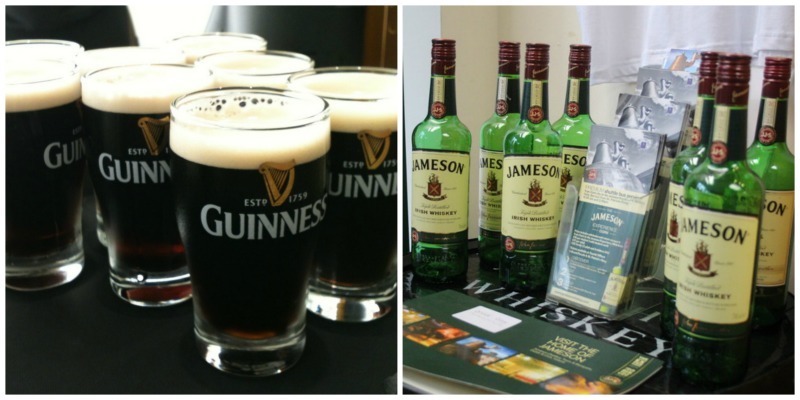 Two in particular – Guinness and Jameson. 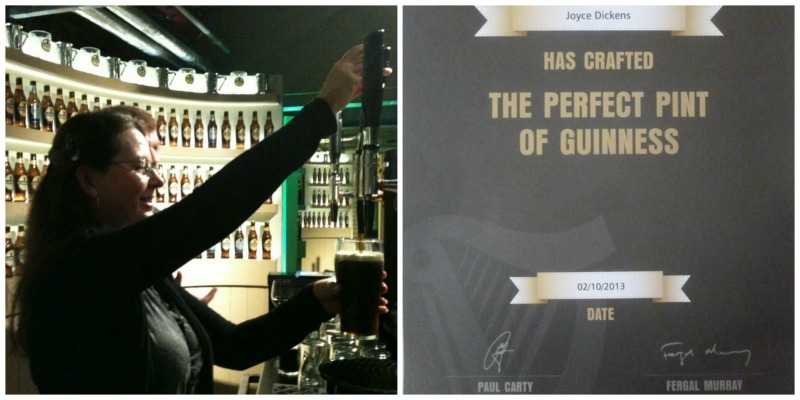 Knowing we were going to be in Ireland, we had been looking forward to visiting the home of Guinness and having the opportunity to pour our very own “perfect pint” for a while. It was exciting to finally have our chance. We even got to enjoy that pint with a nighttime view of the Dublin skyline from the top floor of the Guinness Storehouse. Jameson on the other hand would require a bit more work to find a form I appreciated. Although I tried it straight and it wasn’t horrible. I still can’t say I enjoy sipping whiskey. However, I did find a version that is perfect for me and nearly as possible. Irish Coffee! 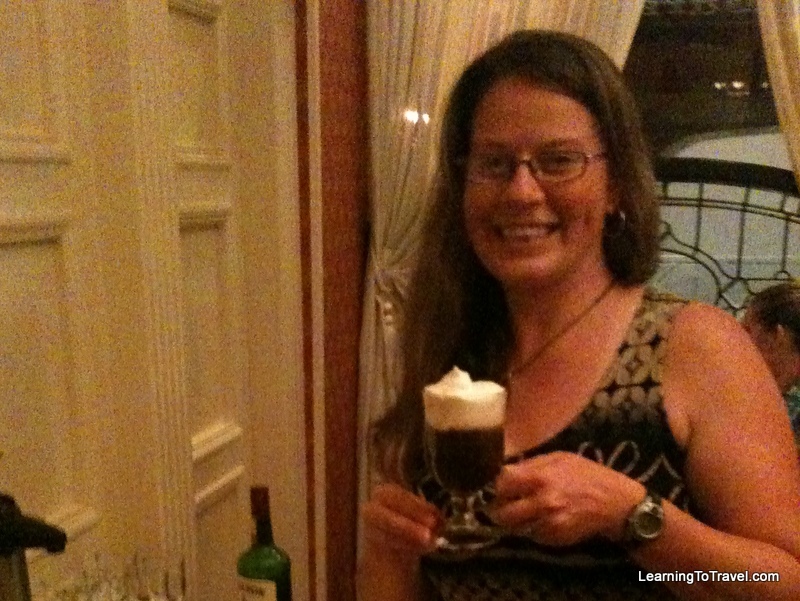 At the Granville Hotel in Waterford, where we had a delicious dinner and a great night’s sleep, we were also treated to a quick after-dinner lesson on making the perfect Irish coffee. Step 1: Heat up the glass with hot water (not pictured). Step 2: Add sugar (also not pictured). Step 3: Add the coffee. Step 4: Add the whiskey. Step 5: Stir and then add hot water. Step 6: Add real whipped cream, “half-whipped” is best (ie. not liquid, but not too stiff). Step 7 (added in my world): Add more real whipped cream. Quantities of all ingredients are pretty much up to the drinker and in the end a perfect Irish coffee should end up looking a lot like a perfect Guinness. There was however, one tiny inconsistency that stood out to us that I need to mention. Apparently the quality of the whiskey is quite important but the quality of the coffee, not so much. We were instructed very specifically to use only the best whiskey, but then were provided with instant coffee. I guess you can see which ingredient takes precedence here.